If at all you’d missed the complete launch party for the 2018 Dodge Challenger SRT Demon, then here it is in all its glory. If you have missed any of the vital stats. of why the Dodge Demon has made such a noise, then it’s due to its 840 horsepower and 770 pound-feet of torque straight from the factory, the ability to hit 60 mph in 2.3 seconds and the quarter-mile in 9.65 seconds at 140 mph. Just over 3,000 editions of the car will be produced ultimately, but that won’t stop the whole media frenzy once it is launched this coming fall. 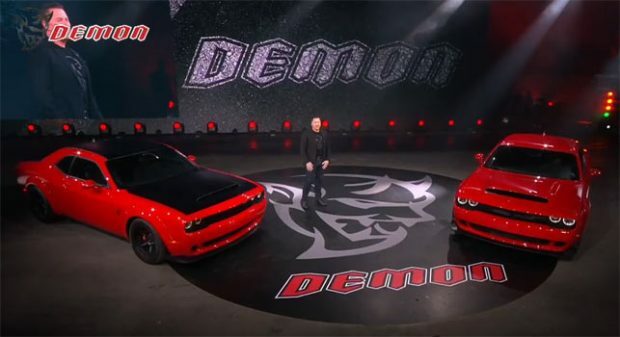 Time will tell how well the Dodge Demon will sit in muscle car history, but at the moment it is standing tall being potentially the most powerful muscle car, stock and straight from the factory. Check out the video below for the full launch video.